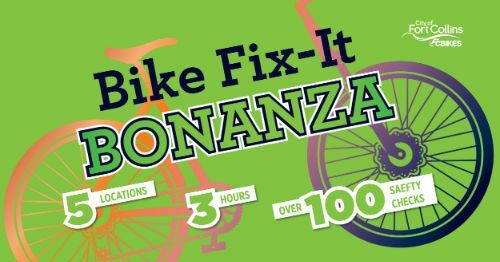 Bike Fix-It Bonanza, April 27, 10 a.m. - 1 p.m.
Download our flyer for a map of locations and a list of partners. Fill out the online application or call us at 970-221-6987 to get your group rolling! Download our flyer to tell a group member about the program. Need help in learning the ins and outs of bicycle commuting? Whatever your situation, a BIKE BUDDY can help get you bicycling to work, school or wherever you’re heading. Choosing gear for your commute and more! 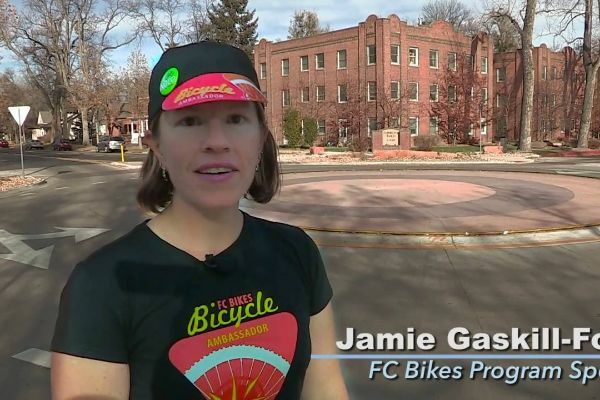 Apply online to request a Bike Buddy or call 970-221-6987. Download our flyer to tell a friend about the program. And many others, including seasonal classes and classes for women! Is your business or organization interested in participating in Open Streets by hosting a tent and free, interactive activity? View our vendor and sponsor package to sign up today. Open Streets is a great way to get your organization in front of thousands of participants. We anticipate 5,000+ participants at each of our events. 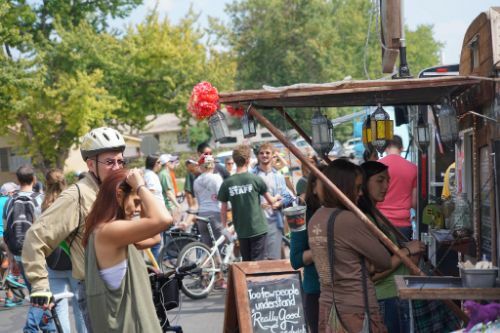 Vendors are strategically placed in small groupings, or "plazas", that feature food trucks, places for people to gather and mingle, as well as other organizations/vendors, live music, and tons of free activities. If you have questions about involvement, contact Nick Heimann, FC Bikes Program Specialist at bmhlaW1hbm5AZmNnb3YuY29t. The call for vendor applications will close on May 1, 2019. 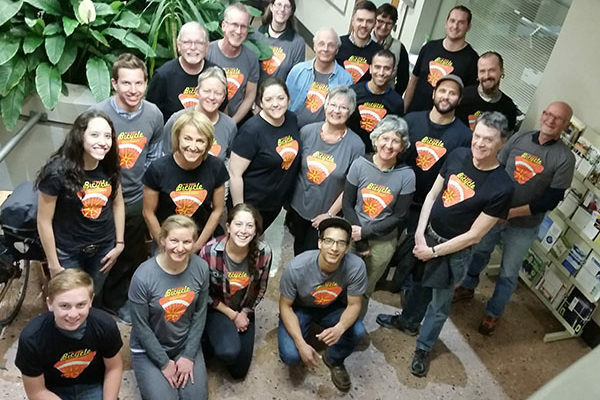 FC Bikes is calling station hosts for the 32nd annual bike to Work Day, to be held Wednesday, June 26, 2019 between 6:30 a.m. and 9:30 a.m. In 2019, we expect to see more than 6,000 people hop on two wheels to ride to work, school, or anywhere! 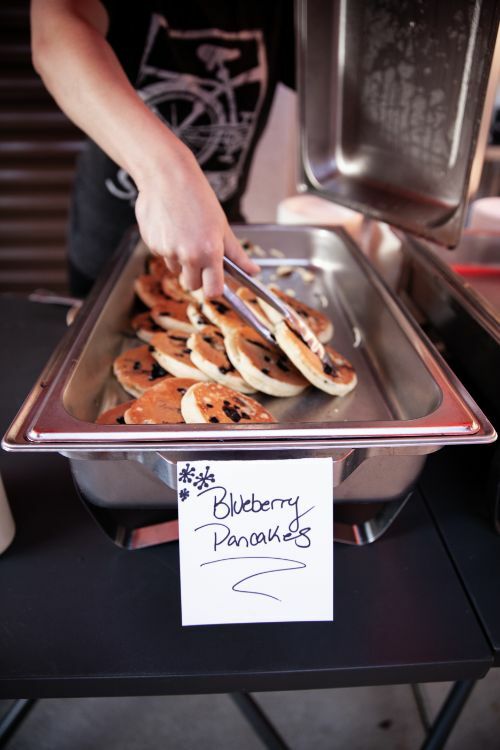 Cyclists can stop at more than 60 free breakfast stations where your business or organization provides breakfast, camaraderie, fun, and more. New to Bike to Work Day events? Learn more with our Station Host Toolkit. Ready to sign up? Fill out our sign up form today! The call for station hosts will end on Wednesday, May 8 at 5:00 p.m. Contact Nick Heimann, FC Bikes Program Specialist at bmhlaW1hbm5AZmNnb3YuY29t with questions. The City of Fort Collins is proposing a new one-year electric assist bicycle pilot program that would allow e-bikes on paved trails in town. 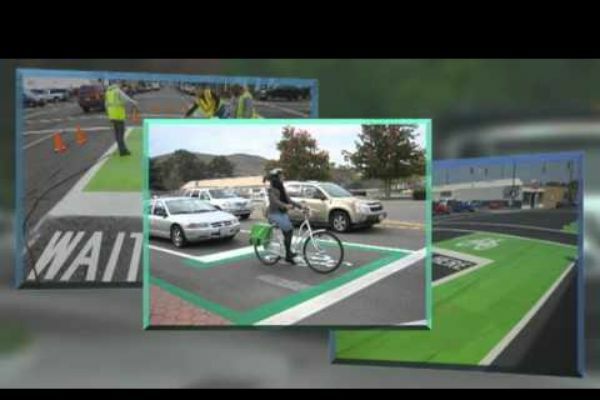 On March 19, City Council will consider ordinances related to this pilot program. 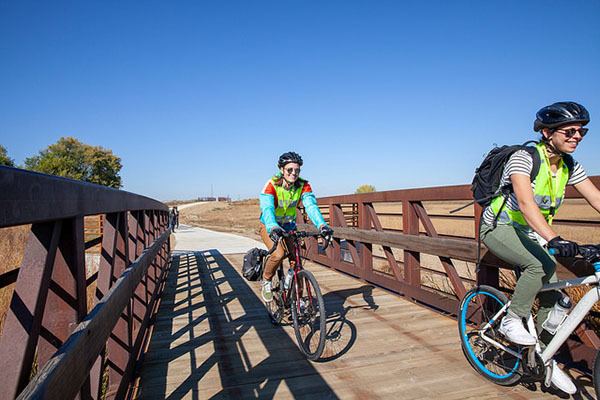 The change is prompted by a new state law allowing e-bikes on trails unless otherwise restricted by a local jurisdiction, and the growing popularity of e-bikes. 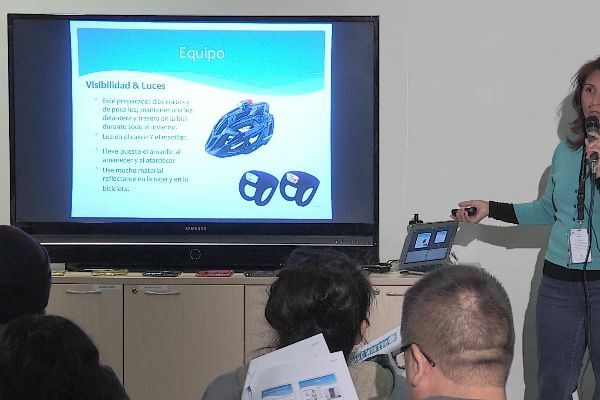 The City’s Bicycle Advisory Committee, Transportation Board and six other City Boards have passed recommendations in support of a pilot program to allow and evaluate e-bikes on paved trails. Current regulations prohibit riders from using e-bikes while the motor is engaged on city trails. The exception to this rule is under ADA regulations, which allow for the use of electric bikes as mobility devices. In 2017, the Colorado Legislature adopted new e-bike regulations, which included allowing Class 1 and Class 2 e-bikes on bike, pedestrian and multi-use paths unless otherwise regulated by a local government (which is the case in Fort Collins). 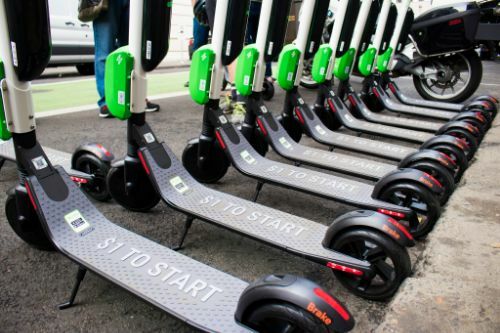 City Council approved first reading, February 19, 2019, updates to City Code related to where shared mobility devices, including e-scooters, are allowed to park and a requirement that operators of these devices dismount in existing dismount zones. Council will vote on final approval at second reading on March 5, 2019. If the proposed Code updates are adopted by City Council, the City, in cooperation with Colorado State University, will administer a Request for Proposals inviting e-scooter companies to submit a proposed plan to develop, install, own, operate, and maintain an e-scooter share program in Fort Collins in spring 2019. 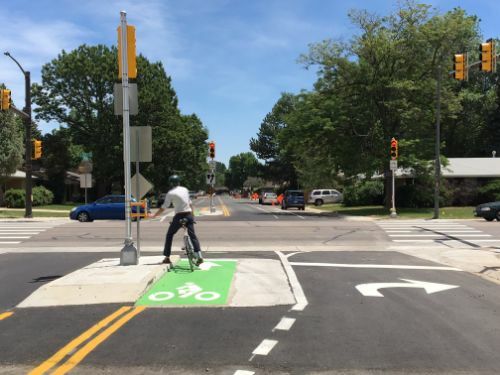 The City is planning to install a signal dedicated to pedestrians and bicyclists crossing Shields at Magnolia, and considering two different design options. This project is a part of the Magnolia Bikeway, a Safe Routes to School Corridor, and the continuation of the W. Mulberry east-west bike route. The selected design is anticipated for construction in Spring 2019. In 2018, Colorado Senate Bill 18-144, “Concerning the regulation of bicycles approaching intersections,” was passed into law; this bill permits a municipality or county to adopt a local ordinance or resolution regulating the operation of bicycles approaching intersections with stop signs or illuminated red traffic control signals, and specifies the content of such local regulation. Under a local regulation, a bicyclist approaching a stop sign must slow to a reasonable speed and, when safe to do so, may proceed through the intersection without stopping. A bicyclist approaching an illuminated red traffic control signal must stop at the intersection and, when safe to do so, may proceed through the intersection. The bill sets the reasonable speed limit at 15 miles per hour. The state bill does not change the law in Fort Collins; rather, it provides consitent language for Colorado jurisdictions interested in establishing a "Stop as Yield" law. 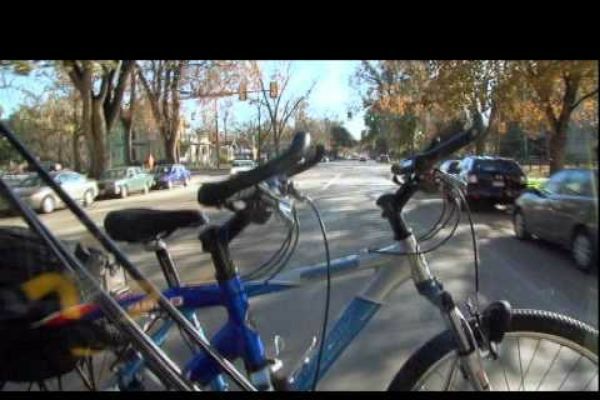 In 2013, the City’s Bicycle Advisory Committee (BAC) initiated a discussion of the Stop as Yield law and expressed interest in further research of the topic and its application to Fort Collins. In October 2013, the BAC unanimously voted against the pursuit of a Stop as Yield law in Fort Collins at that time. A summary of the analysis if available here. 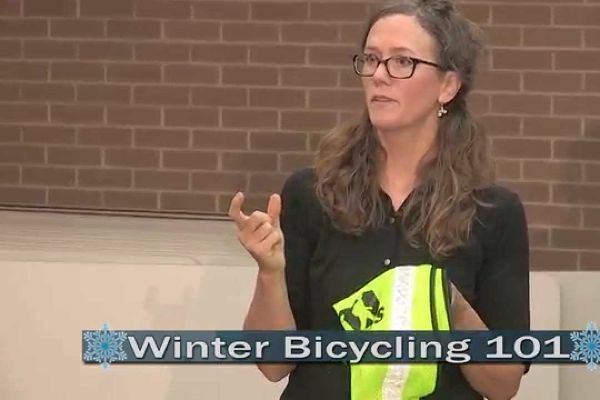 With the adoption of the new 2018 State law, the City's Bicycle Advisory Committee and Transportation Board are revisiting the topic. The BAC will be discussing this at their August 27, 2018 meeting. Are You Ready To Take The Big Jump? 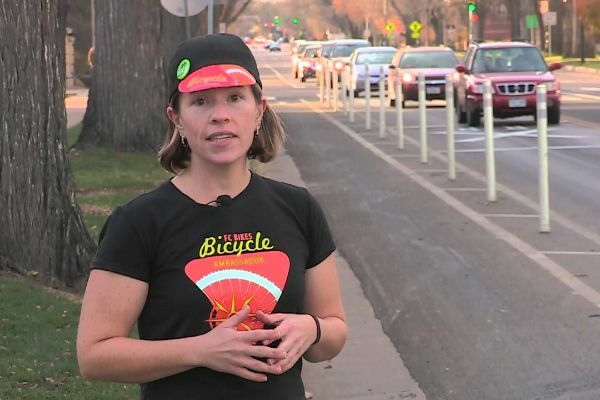 Fort Collins was one of 10 cities in the nation selected to participate in PeopleForBikes’ (PFB) Big Jump Project with the goal of getting more people on bikes. 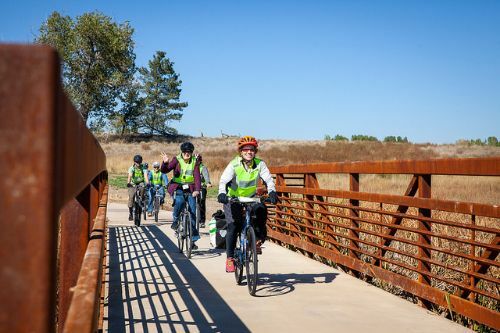 Through this three-year initiative, we will work with community organizations, leaders and residents to implement a comprehensive bicycle program in Northwest Fort Collins with the goal of creating a safe, connected, comfortable and vibrant environment for bicycling. Learn more about the project and how to get involved at fcgov.com/BigJump. Ride Smart Drive Smart is an education, enforcement and encouragement initiative developed by FC Bikes in partnership with Fort Collins Police Services. 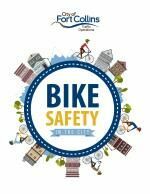 The initiative is designed to educate both cyclists and motorists how to safely and lawfully share the roadways, encourage smart riding and driving behavior and enforce laws for safety. 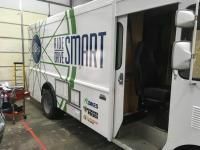 Look for the Ride Smart Drive Smart van around town where we will be doing field education and events. 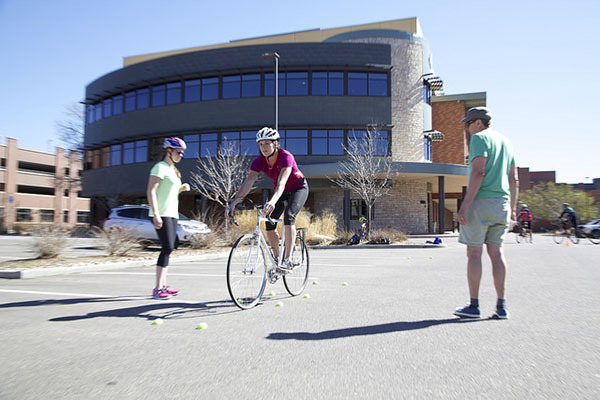 Learn how to Ride Smart and Drive Smart in our free classes offered year round. Overall bike crashes increased from 2015 to 2016. However, they are lower than the peak in 2012, and severe crashes have seen a general downward trend. Compared to 2012, overall crashes are down 11% andsevere crashes are down 32%. The first step to make our roads safer is to understand how many and what types of crashes occur in Fort Collins. By carefully reviewing traffic data and crash reports, we are able to determine safety trends and identify priorities. 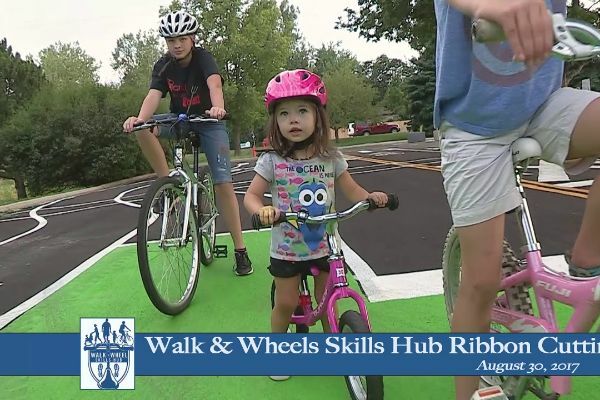 Take a look to see how we are improving safety across Fort Collins and understand how these trends enable us to focus our safety and prevention efforts. FC Bikes is jumping on the social media train and now has our own Facebook and Twitter page! Please like our page to stay up-to-date on projects, upcoming events, how to get involved in the local bicycle scene, and lastly, industry and partner news. You can find us at FC Bikes Facebook and FC Bikes Twitter. For the latest info, check out detours posted on the City's Trail System Status Page. Sign up to receive notifications regarding trails in your area. For on-street maintenance projects, check out the Street Maintenance Program's page. Cyclists should always adhere to construction closures and posted detours. These are put in place for your safety.